A new style of accommodations in Oregon’s Wine Country, 3rd Street Flats offers guests the stylish touches of a hotel, the hospitality of a bed & breakfast, and all the amenities of a vacation rental. Inspired by European travels and a desire for authentic travel experiences, 3rd Street Flats offers guests the chance to rent their own apartment in the heart of historic downtown McMinnville. Stay for a night or stay for a week, but stay long enough to fully experience the amazing food and wine that’s all just a few steps away. With walls filled with original art and local wine and chocolate waiting in your flat, 3rd Street Flats is ready to help you fully absorb the wonderful spirit of the Yamhill Valley! The old adage ‘Location, location, location’ says it all. 3rd Street Flats offers the prime location for exploring Historic McMinnville and the rest of the Yamhill Valley. Ideally situated above Anthony Dell Cellars and directly across the street from the Willamette Valley Vineyards Wine Center, 3rd Street Flats allows guests to experience Historic McMinnville without the hassle of a car or even the need for comfortable shoes. When you stay at 3rd Street Flats, Historic McMinnville is literally at your doorstep. Want fabulous dining? Walk downstairs. La Rambla, which prepares northwest inspired Spanish Cuisine, is right next-door. Feel like eating in? Harvest Fresh, a grocery store specializing in fresh, local and organic foods, offers everything you need to prepare a fabulous meal in your Flat—and it’s just across the street. Need a coffee to get you going? Three doors down, Cornerstone Coffee roasts their own. 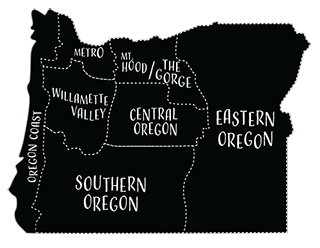 Want to start tasting those fabulous wines the Yamhill Valley is famous for? Anthony Dell Cellars and the Willamette Valley Vineyards Wine Center are just down the stairs.